Custom Orthotics Lower Sackville NS | Scotia Chiropractic Health Centre Inc. Custom Orthotics at Scotia Chiropractic Health Centre Inc. 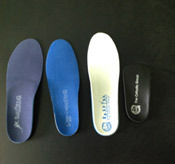 Custom orthotics help with proper foot biomechanics and support. If you are experiencing foot, knee, hip or back pain you may benefit from orthotics that are custom made for your feet and shoes.